If you don’t get the joke, it’s because you’ve never tried to harvest walnuts this [stupid] way. I tried it today. How did it go, you ask? Well, do you see me eating any delicious walnuts? No, you don’t. So that’s how it went. We have several walnut trees on our property, so I was excited to try this out. I waited patiently until late summer/early fall when the nuts began to drop from the trees. I paid my nephews an extortionate amount of money for full bags of walnuts picked from their yard. I do have my own walnut trees but hey, if you have access to child labor, why not use it? I brought the bags home and placed them in a quiet corner of the driveway, with the bags open so the nuts could dry out. I figured this would take several weeks. I waited and waited. Partly because I was being patient, but mostly because I didn’t feel like getting around to them. In the intervening time, it rained. And then it rained again. And again. I thought this might impede the drying out process, but I was too lazy busy to move the walnuts. I figured I’d just wait until a dry day to harvest them, and they’d be fine. Today was that day. 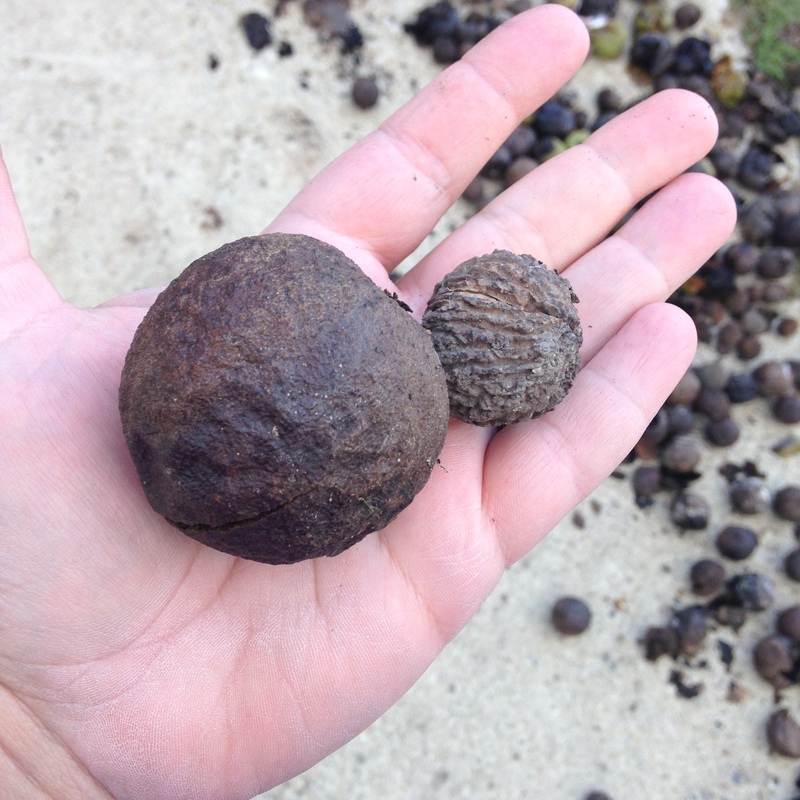 I’ve been hearing the crack of walnuts popping under truck tires as our neighbors drive up and down the road, and I got the itch to harvest our walnuts. I got in the car while my daughter Eve shook the nuts out of their bags and spread them all over the concrete part of our driveway. Then Eve hopped in the car and we rolled over the walnuts, back and forth until we thought we had busted them all open. Each nut made a loud crack! as it crunched under the car tires. It was like a nutty 4th of July. Every boom made us scream with delight and I could almost taste our walnut reward. 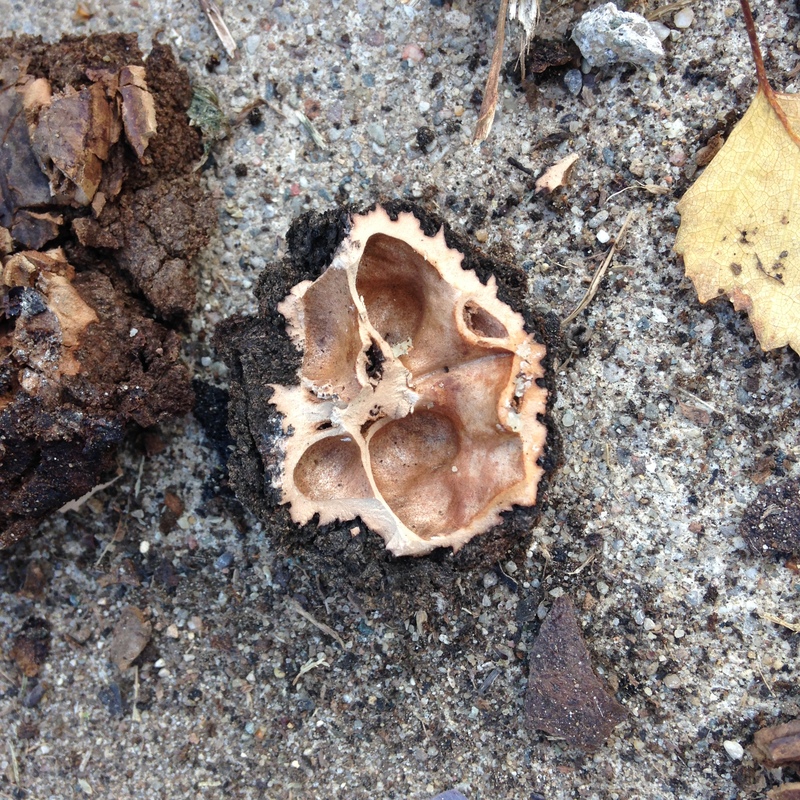 The outer husk and the inner shell of a dried Black Walnut. How could they make so much noise and still be not cracked open? And most of the husks were rotten. I thought they were supposed to turn black as they aged, but now I wondered if they molded because of being in the wet bags for so long. Some of the outer husks had split open, but the hard shell inside was still closed tight. I had succeeded in cracking open approximately four nuts. Of these, all were empty because the walnut meat had shot out who knows where under the pressure from the tires. See a walnut in there? Me neither. 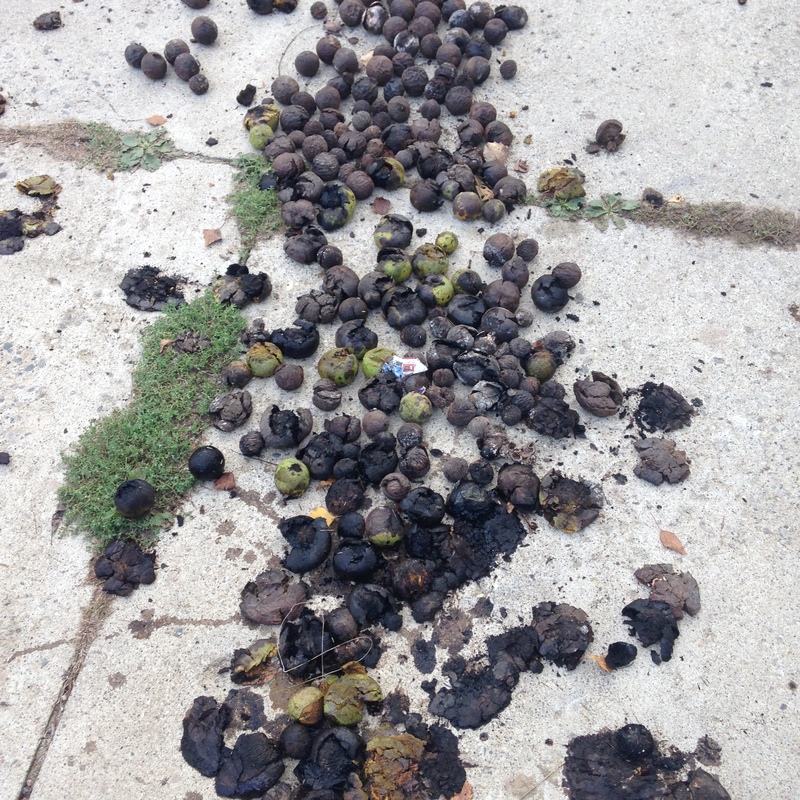 Crestfallen, I examined the pile hoping to find even one nut we could actually eat. I kicked around a few of the nasty black globes and that’s when I noticed the stains. 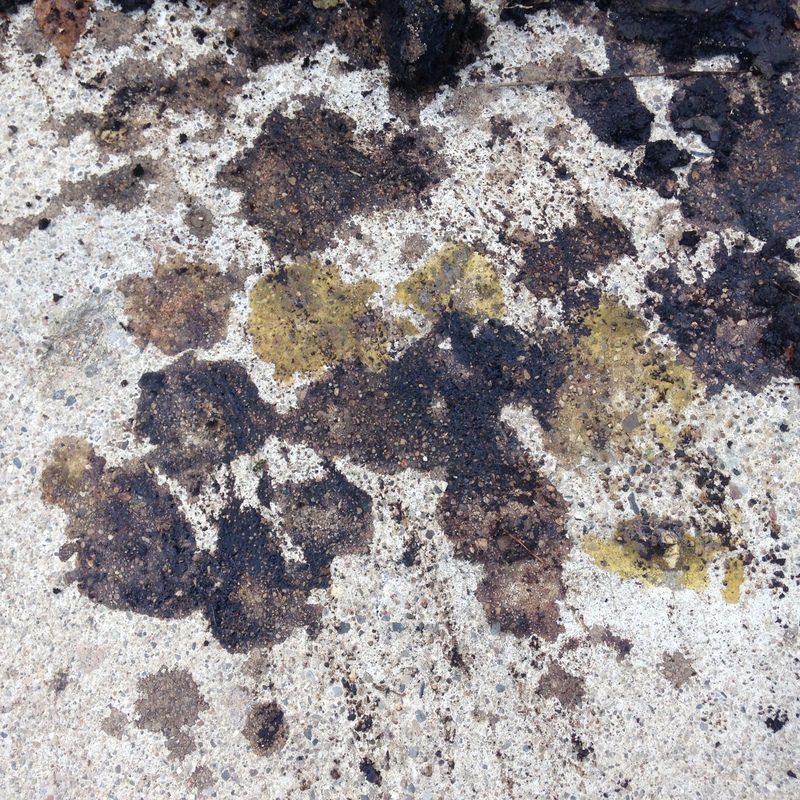 Deep black spots spread across the driveway like a plague, and all I could think was that my husband was going to have a fit. Driveways are near and dear to a man’s heart, I’ve learned. Eve came over to see what I was groaning about, slipped on the nuts like Wile E. Coyote on a banana peel, and stained her favorite pants. Someone’s in trouble, and I think it’s me. For a brief moment, I had a delusion that the spots would wash off with a simple splash of water. 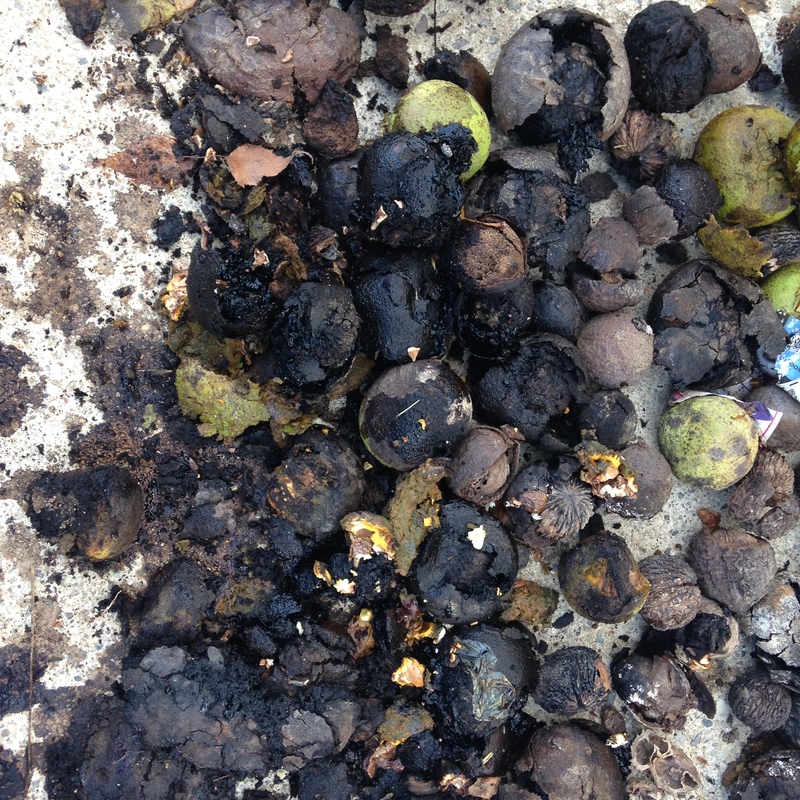 But then I remembered reading that walnuts can be used as a natural dye and I knew we were doomed. I was beginning to wish I’d never heard of walnuts. Not one to give up until I’ve really driven my failure home, I took Eve up to the road to see if we could find any open walnuts out there. “Cars have been driving over nuts in the road all day, and those nuts just fell from the tree so they should be nice and clean,” I lied. You know how they say ravens are extremely intelligent birds? They will drop a nut in the road on purpose, then wait for a car to drive by and crack it open for them. After the car passes by, the raven will swoop down to retrieve the nut and enjoy a nice snack. Today I learned, sadly, that I am not as smart as a raven. 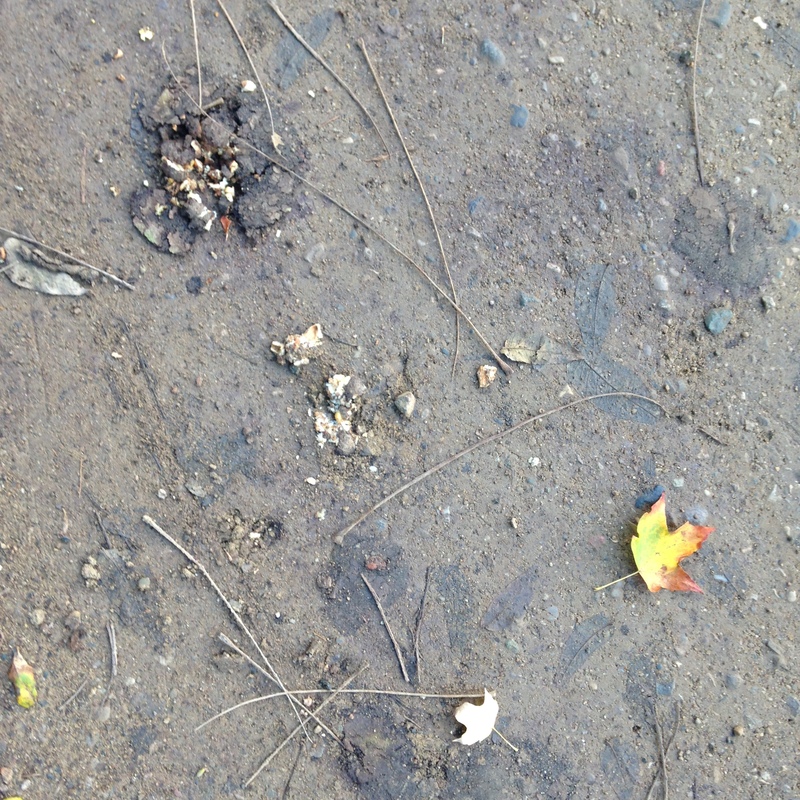 Eve and I picked over all the nuts in the road, looking for some that might be edible. Guess how many we found? None! The nuts on the road were in one of three states: 1) still not open at all (how does this keep happening?! ); 2) cracked open but empty because the nut meat went flying in some random direction and is nowhere to be found; or 3) cracked open with a little bit of something inside that may or may not have been nut meat at one time, but is now so smashed that it’s beyond recognition or edibility, even for a raven. Even a bird can get nuts from the road, but Eve and I moped back to the house empty-handed. And hungry. Deflated, we set about cleaning up the driveway as best we could. Husbands, please be kind if you are ever at work and get this text from your wife: “Can you show me how to use the power washer tonight?” Don’t freak out. Your wife has probably been working very hard on something challenging, with little to show for it, and all she wants to do is erase the driveway stains and forget all this walnut business ever happened. And when I texted back “Don’t you even want to know what it’s for?” he said “LOL.” I love him. I can barely see because of the tears streaming down my face. You are freaking hysterical.